Eph. 5:15-17 (NKJV) See then that you walk circumspectly, not as fools but as wise, redeeming the time, because the days are evil. Therefore do not be unwise, but understand what the will of the Lord is. Eph. 5:15-17 (NIV) Be very careful, then, how you live—not as unwise but as wise, making the most of every opportunity, because the days are evil. Therefore do not be foolish, but understand what the Lord’s will is. Colossians 4:5, Be wise in the way you act toward outsiders; make the most of every opportunity. Taking advantage of opportunity is the purpose of God’s gift of time. Living life on purpose is the reason for living. Redeeming the time; or, buying the opportunity: is a metaphor taken from merchants, that diligently observe the time for buying and selling, and easily part with their pleasure for gain. It is the idea of a merchant who, knowing the value of an article and the good use to which he can put it, buys it up. “Because the days are evil”: The days of life in general are so exposed to evil, as to make it necessary to make the most of the seasonable opportunity so long as it lasts. These are days full of difficulties and dangers. Luke 9:51, (NLT) As the time drew near for him to ascend to heaven, Jesus resolutely set out for Jerusalem. Time is the overall framework. Moments present opportunities for taking action. We maximize opportunities by taking action. 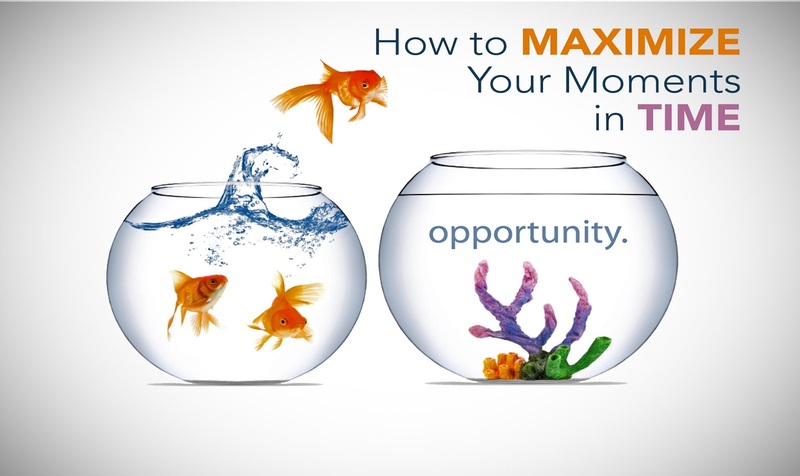 “Maximize” means: To increase to the greatest possible amount or degree; make the most of it. The time framework is like looking at a calendar. Moments are like selecting dates on the calendar to take action. Actions such as prayer, reading, studying, resting, working, meetings, writing, teaching, training, being trained, and every other fruitful thing you helps you maximize your time. Denzel Washington offered a poignant statement on the importance of seizing opportunity during an acceptance speech for an acting award. He said, ”Ease is a greater threat to progress than hardship” and "Without commitment you'll never start, Without consistency you'll never finish." Why is ease a greater threat? Being at ease is about wasting time and failing to maximize moments by taking action. Hardship, while painful, usually causes us to take effective action. It is not that God is greater in times of hardship. It is more likely that we possess greater focus during times of hardship. Psalms 90:12,(NKJV) So teach us to number [enumerate; mention one by one] our days, That we may gain a heart of wisdom. “Numbering” your days is not about counting days but making days count. Jesus knew he had only 3 1/2 years to fulfill His purpose after God commissioned Him. He said in John 9:4, "I must work the works of Him who sent Me while it is day; the night is coming when no one can work.” He focused on seizing opportunity by taking action in moments of time.